The Good Samaritan Society National Campus Corporate Headquarters was featured in the Campus Issue of Landscape Architect & Specifier News. The June Issue featured 11 projects from around the country. Stockwell provided the Civil Engineering and Landscape Architecture, while Koch Hazard Architects was the Architect-of-Record. The project expands and updates a campus that began in 1989 when the Good Samaritan Society, the nation’s largest, non-profit, owner-operator of senior living facilities, purchased a former bank card processing facility in Sioux Falls, SD. The national headquarters was first expanded in 2001 and then again in 2015, which also included interior renovations and new exterior spaces on campus. Good Samaritan Society’s desire for a staff-centric focus resulted in new campus spaces for staff to engage, reflect, and relax. 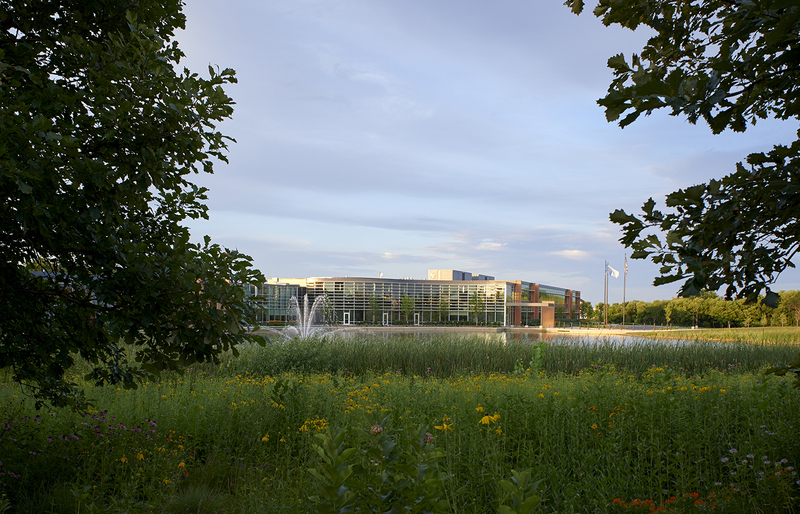 The addition to the east of the central reflecting pond expands the pond and results in two unique spaces, anchoring the outdoor campus. An outdoor amphitheater, patio, and prayer garden on the west side of the pond creates a space for all on-site staff to gather for weekly chapel and devotions. An outdoor patio up against the central pond on the east side provides a serpentine shady respite. The design enhances the sense of an embracing campus with a permeable boundary between inside and out, encouraging staff to take advantage of its many outdoor amenities.